Initiator of Romanticism, refounder of Portuguese theater, creator of modern lyricism, creator of modern prose, journalist, politician, legislator, Garrett is a real example of the inseparable alliance between political man and writer, citizen and poet. Enthusiastic supporter of Liberalism that in the nineteenth century radically transforms the Portuguese society, Garrett was a Portuguese interventive in various facets of life. He is considered by many authors as the most complete Portuguese writer of the nineteenth century, since he left us masterpieces in poetry, drama and prose, innovating writing and composition in each of these literary genres. 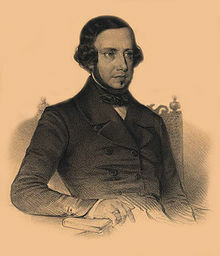 Garrett was also the major driving force of the theater in Portugal from Romanticism. It was he who proposed the building of the Teatro Nacional D. Maria II and the establishment of the Conservatory. The situation of theater in the country has been radically altered by the presence of Garrett. He managed to change the foundations of the theater which began to be associated with the concerns of a society better and better literate and attentive. Camões is a poem written in 1825 which is attributed to the beginning of Portuguese Romanticism. Although scarce, the novelistic work of Garrett stands out for the originality. As Viagens na Minha Terra can be considered the first Portuguese modern narrative using an informal style, in permanent dialogue with the reader, the author presents in the manner of Stern, a masterpiece of intellectual irony; under the pretext of a travel’s chronic, offers a comprehensive and lucid representation of the actual time. Frei Luís de Sousa is the largest Portuguese romantic drama, written by Garrett and one of the best plays of Portuguese literature. It was first performed in 1843 and published in the following year. Folhas Caídas is the last and most important work of Garrett, published anonymously in 1835, and the best work of Portuguese Romantic poetry.